St. Patrick's Day is next week so time to start getting your Green on! If you'd like to try an Irish dish that's easy to make and delicious while there is still a chill in the air, try Colcannon soup. Colcannon is a traditional Irish dish made from potatoes and cabbage or kale with milk, cream or butter added. It may also contain other ingredients such as scallions, leeks, onions and chives and often eaten with boiled ham or bacon. I've made Colcannon soup before but without the creamy twist and cheddar straws. This version, again from Full-On Irish by Kevin Dundon, is made with savoy cabbage, potatoes, leeks and onion, thickened with cream and served with cheddar straws on the side. A delicious combination! Don't the cheddar straws remind you of a rustic walking stick? Whether used in soup, slaw or egg rolls, I love cabbage! It is thought that cabbage was domesticated in Europe somewhere around 1000 BC (! ), although Savoy Cabbage was not developed until the 16th Century. As you prepare to take a mental stroll through the lush green meadows of The Emerald Isle, grab your cheddar walking stick and enjoy a bowl of hot Colcannon. It will warm the cockles of your heart. They can be made up to three days in advance and stored in an airtight container at room temperature. Crisp in a preheated oven at 200C/400F/Gas 6 for 2-3 minutes before serving. To make the cheese straws, place the puff pastry on a lightly floured work surface and sprinkle the Cheddar over half of the puff pastry in an even layer. Fold the portion without cheese over the cheese layer to enclose the cheese layer completely. Roll out to its original size, using a little extra flour if necessary. Place on a baking sheet and brush with the beaten egg and place in the fridge for 15 minutes to rest. Cut the chilled cheese pastry into 10 cm/4 in lengths, each 1 cm/1/2 in wide. Hold the ends of each strip between your fingers and twist the ends in opposite directions. Arrange the twisted strips on non-stick baking sheets and sprinkle a little salt over each one. Bake for 10-15 minutes or until crisp and golden brown, then transfer to a wire rack and leave to cool. Serve warm or at room temperature. Heat a large stock pot and sauté the bacon over a medium heat for a couple minutes until the fat is rendered. Stir in the onion, potatoes, leek and cabbage, then cover with a lid and cook over a low heat for 15-20 minutes until well softened but not browned, stirring occasionally. Pour the vegetable stock or water into the cabbage mixture and bring to the boil, then season to taste with salt and pepper. Stir in the cream and simmer for a few minutes until the soup has a creamy texture. To serve, remove the soup from the heat and whisk in the butter. It is important not to reboil the soup once the butter has been added or you’ll find it will curdle. 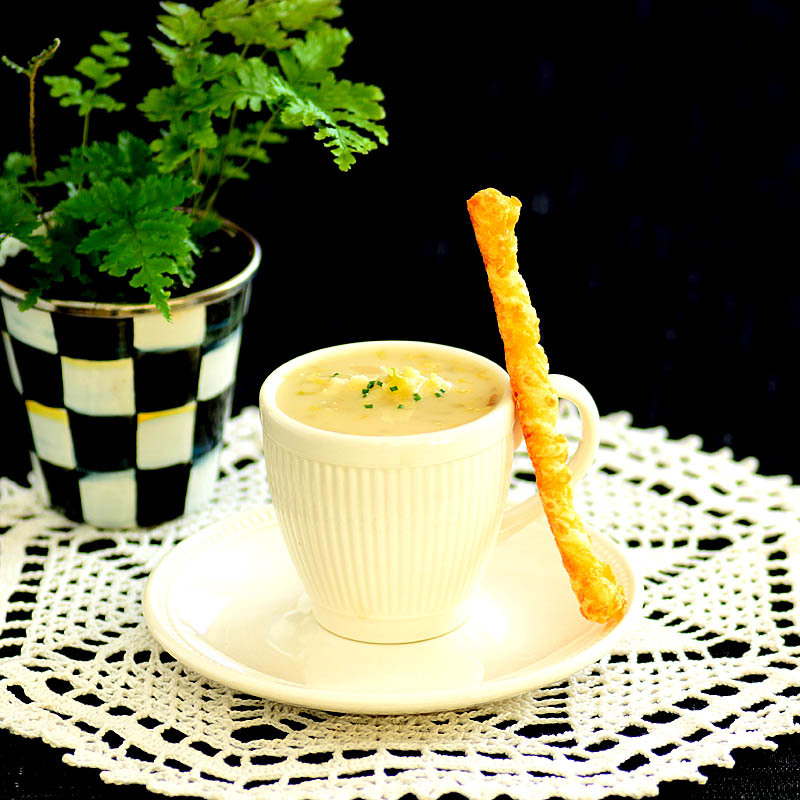 Ladle the colcannon soup into cappuccino cups or warmed serving bowls and arrange a cheese straw to the side. 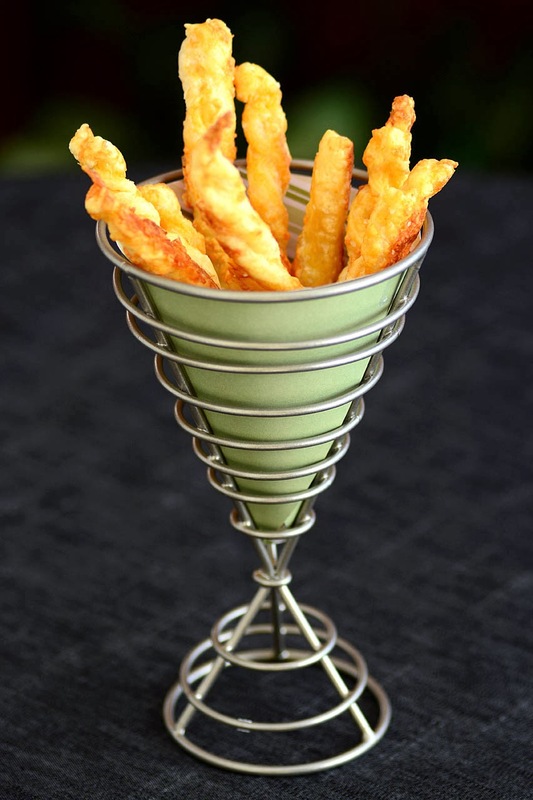 Serve the remaining cheese straws in a separate dish at the table or use as a canape. Oh this just sounds so yummy that we may not be waiting for St. Pat's. You do such a masterful job taking photos of food that I'm blaming that skill for my lack of restraint. Love Colcannon..w/ bacon and cabbage..so this is a sure hit. Snowstorm here..weather warning and all..
PS Cute cute fry/straw holder..I have wannabes.. Sounds and looks delish! Great pics! Visiting as your linky neighbour on Kathleen's Blog Crawl. No doubt I would enjoy this soup too. Love cabbage! Oh my that all sounds so good! Thanks for sharing the recipe! Have a Happy St. Patrick's Day! What a hearty soup! I love making those cheese straws, they look so elegant! Sounds delish, but have never had Colcannon soup - at least that I remember. Sounds like a yummy comfort food. Thanks for sharing the recipe. I love this soup, the cheddar straws are a great accompaniment! I am sorry I have not been commenting, I stopped getting notifications as some point and just realised! Oh your recipes look delicious -- I've already pinned them to my recipe boards!! I'd love a bowl of that soup, as it's supposed to be really cold here again tomorrow. :) Your Irish linen, lace, and wool are lovely, too. Thanks for sharing these recipes! Visiting from Kathleen's Blog Crawl -- Happy St. Pat's Day to you! This could very well end up being our St. Patrick's Day dinner! Right down to those delicious-looking cheese "walking" sticks. Thanks for the recipe. I'll make this. We love to have soups for dinner. I too love a good cabbage soup, Susan. Those cheese straws look to die for. Your presentation of the soup with the cheese straws is fantastic. I'm very partial to cheese straws and they disappear quickly around me. Great fun, Susan! Always love Kathleen's Irish blog crawl, but don't always take part....I did this year. Your cheese straws are divine...so cheesy and I wouldn't dare make them unless there was a houseful of people as I'd eat them all myself! Amazing how the Irish took to potatoes, isn't it? They are perfect with their cabbage and lovely milk products. Ireland was made for dairy cows with all the emerald grass they have. Have a lovely Paddy's day with this lovely dish! I love this soup Susan. We are on the same page this week. I just did bangers and colcannon. I've made colcannon but not the soup but yours looks delicious and as a cheese lover I'd really go for the cheese straws. Susan amazing and delicious récipes, and love your pics!!! I wills see your friend!! Susan, I have my 'green on.' I spilled a green smoothie all over me this morning. Being in the middle of yet another snow storm, I would happily be all over that soup right now. I've only had Colcannon once, years ago, and really liked it. I added kale to mine, but no bacon. After seeing your recipe, I'll be sure to reverse that, next time. Love the idea of colcannon as a soup. Terrific photos…perfect for a St. Patrick's Day celebration. We love the traditional colcannon, so I am sure we will love this, too. Beautiful photos, Susan. A delicious meal! The soup looks delicious! And I love all your photos! Oh my this combination is perfect. Yum, yum, yum! I've never tried colcannon soup but wondering why not? Terrific - have a great weekend. Such a beautiful recipe Susan...like the hidden vegetables in it...and yes, the cheese straws just look perfect with it. I'm with you when it comes to liking cabbage which doesn't seem to be on everyone's list of favorite foods. As for soup, I like it any time. What a clever idea, I've made colcannon as a side dish, but never thought of making it into a soup! My luck must have changed because today you are not labeled as dangerous, but that is what happened last time, so check it. On to the good stuff, your soup and straws! It looks so delicious! I have made colcannon but never as soup, I must try it! Thanks so much for being a loyal crawler! More snow coming tomorrow! Thank you all and Happy St. Patrick's Day! O love colcannon but have never had it in soup form. Such a great idea. Wow, you've made a boring soup dish into a very-very stunning and delicious looking photograph!!! i adores your skill my friend!!! Wow Sue, the soup looks so yummy - we love cabbage soups. It is so cold today! We can definitely use a bowl of soup! And, we love the cheese sticks to go with it, nice idea. Cold and rainy here today so I would love to have some of your delicious soup and cheese straws!! 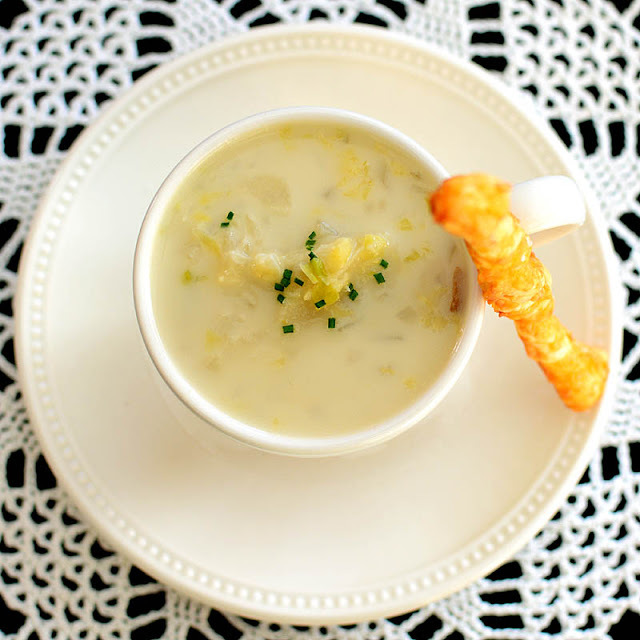 :-) I love this soup and love cheese straws, my kids really love the cheese straws too! Susan, did you see my post today, Hot Fudge Cake!! Glorious photos, Susan...they positively GLOW!! The sounds sounds yummy...DH will love you for sharing the recipe. He could have soup for lunch & supper every day of the week & be happy. The cheese straws are darling. I've never tried making them. I always thought they were a lot of work...didn't know you could make them with puff pastry!! Thanks! I never made colcannon soup, Susan, but it sounds delicious! Happy St. Patrick's Day! I love cabbage too, Susan, and your soup sounds delicious. What a clever use of the yummy ingredients in colcannon. Whatever would we do without purchased puff pastry. Your cheese sticks would be wonderful with summer salads. Looks like a hearty soup, I am sure those cheese straws can hold their own too! 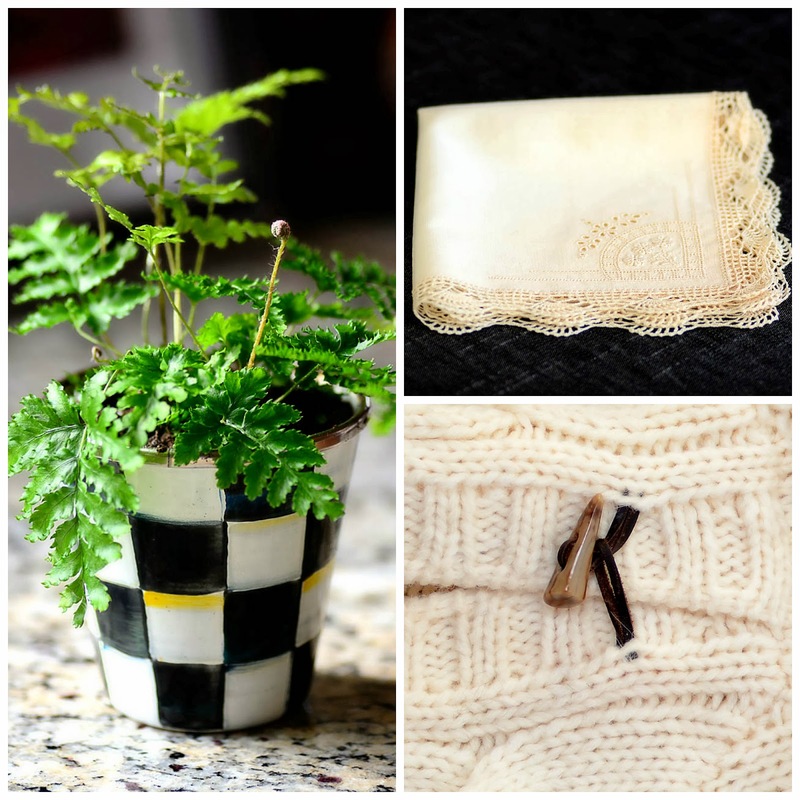 By the way, the linen in the small picture is so delicate looking. Vintage? It sounds wonderful. I haven't heard of this soup before but I am a cabbage lover too and this would be so fun to try. Your cheese straws are beautiful and have me drooling - guess I need to get off the computer and fix dinner! I love this spin on colcannon! The cheesy straws might just be my favorite part though. But then again, what good is soup if you have nothing to dunk in it!